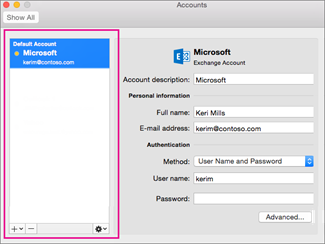 This article can help you to set up your first account in Outlook 2016 for Mac. You can set up your work or school email accounts (Office 365 or other Microsoft Exchange accounts), and personal, online email accounts such as Google Gmail, Yahoo! Mail Plus, Comcast, or AOL (IMAP or POP), by using only your email address and password. 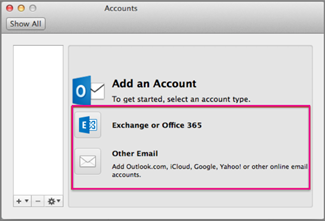 NOTES Before you can set up your first email account in Outlook 2016 for Mac, you'll need to know what type of account you have: Office 365 or Microsoft Exchange or IMAP or POP. Generally, work or school accounts use Exchange or Office 365 accounts, and most web internet service providers offer IMAP or POP accounts. If you don't know which type of e‑mail server your account uses, check with your email provider, internet service provider, or email administrator. IMPORTANT To set up additional email accounts, see Add more email accounts. IMPORTANT If you don't know which type of e‑mail server your account uses, check with your email provider, internet service provider, or email administrator. 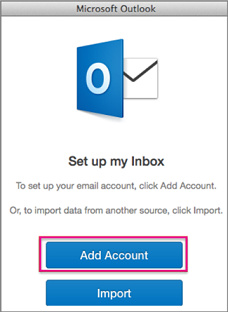 Click Exchange or Office 365 to add your work or school email account. Click Other Email (such as IMAP or POP) to add your personal, online email account, like Hotmail, Outlook.com, Google, MSN, iCloud, etc. Enter your account information, and click Add Account. NOTE For a work or school account with Office 365 subscriptions, please make sure you use your email address for both the Email address and User name fields. TIPS To add more email accounts, on the Tools tab, click Accounts.